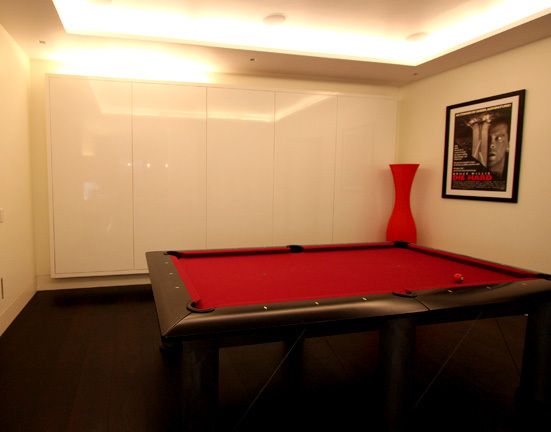 The large storage units behind the pool table are big enough to house a spare mattress and have plenty of other shelving options and are finished with push to open high gloss doors. The red desk is made using corian solid surface and has two drawers incorporated. The filing cabinet / radiator cover & the shelving unit / radiator cover is made from mdf with a high gloss spray finish. This kitchen is high gloss white spray finished doors, a corian worktop that wraps round and seamlessly drops down and creates a table. There is also led plinth lighting and splash back lighting.